A few Thursdays back I posted this on the Albion Yard Facebook page which likely seemed bit left field even for regular readers of the blog, so why has it and other XTC references appeared? Well, earlier in the year I had a chat with Alan Buttler from modelu who mentioned that he’d been commissioned to scan a 1970’s pop band for a forthcoming documentary, and would I be interested in colouring them in? The short answer was ‘yes’ and in due course the figures arrived. 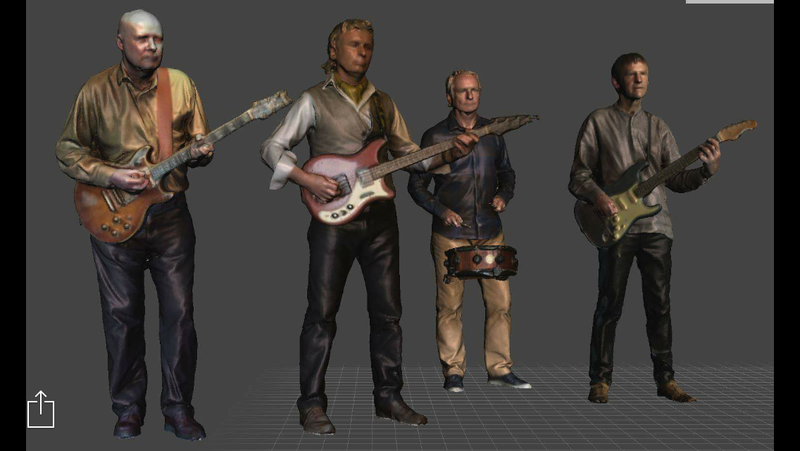 I’d got five sets to do, and to be painted to get as close as possible to the scans that Alan had taken of the band. Two each playing instruments, (in case of breakage) one each left/right foot forward and one standing. 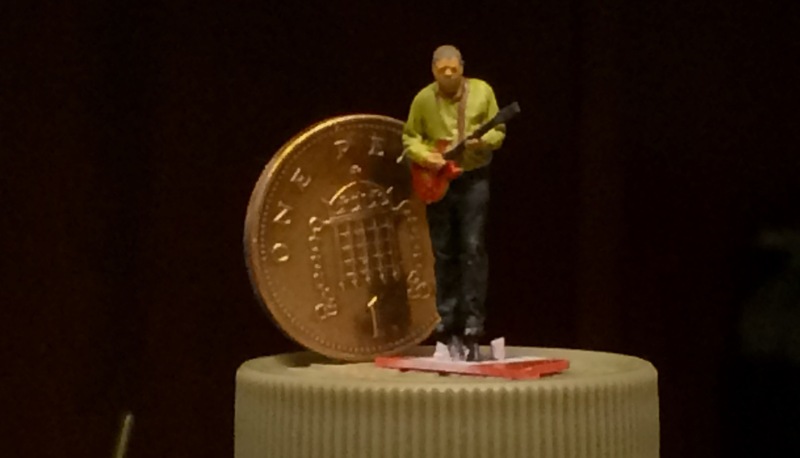 The figures were required in 4mm scale so that made them a bit easier as it was a scale we’re both used to working in. We knew the figures were to be used in the filming of the documentary, but not in what context. The images are iPhone images as the task was very much to be kept low key so no work in progress images were taken. One figure required a rework by Alan and that late change kept us up to a deadline, meaning a hand delivery at a service station a day or to before filming. The filming went well and as a thank you Charlie Thomas ( huge XTC fan) from specialtreats, invited us to the preview showing of the programme in Soho in London. This was the opening screen that met us, and we both were thinking we recognise that building, and then the penny dropped, this is a signal box on Pendon Museum’ s Vale scene. That came as a surprise, but not quite as much as the rest of the programme provided. The figures have been used throughout the documentary, we thought we’d get thirty seconds or so, but throughout the seventy minute show the figures appear, as does the Museum at Pendon. After the showing it was very pleasing to be asked about the figures and their production by both band members and the TV company staff who thought both Pendon and the figures/modelmaking were intriguing and interesting. The bands story is told through the programme and whilst they weren’t a band I was particularly interested in at the time, the narrative subsequently had me listening to tracks by them that I’d missed at the time and in the intervening years. I was pleasantly surprised If you’re a fan of the band and their genre there’s also a contemporary band worth seeking out, Fassine who’s influences include XTC. So there you are, this Saturday, Sky Arts at 9PM, it’ll make a change to see a good British Swindon band, up against X factor and Strictly, if you’ve had enough sob stories, tantrums and sequins, you know what to do…. This entry was posted in 2017, 3d, 3d printing, apple, Bachmann, blog, blogging, British Rail, Cameo, dapol, DCC, dcc sound, Eastern Region, Eighties, EM, Exhibition, film, finescale, flying scotsman, Friends, Great Western, hero, history, HO, hobbies, Hornby, Inspiration, Interweb, iphone, Layout, life, LMS, LNER, media, Midland Region, Model Railroad, Model Railway, Model Railway Journal, modeling, Modelling, Modelu, music, n gauge, Nevard, O Gauge, o scale, Old school, OO Gauge, Oxford rail, Photography, research, review, Sky, Sky arts, social media, Southern Region, Swindon, television, throwback thursday, toy train, Toy trains, toytrainset, train set, trainset, Uncategorized, Western Region, Xtc and tagged Art, Bachmann, blog, Canon G10, Exhibition, HO, Hobby, Hornby, iphone, Layout, life, model rail, Model Railroad, Model Railway, nevard, o scale, OO, photography, Railex, Railway Modeller, Rapido, throwback thursday, toytrain, toytrainset. Bookmark the permalink.